Can a tan be healthy? Some people think that tanning gives them a healthy glow. But tanning, either outdoors or indoors with a tanning bed, is not healthy at all. It exposes you to harmful rays and puts you at risk for health problems such as melanoma and other skin cancers. What are UV rays, and how do they affect the skin? Sunlight travels to earth as a mixture of both visible and invisible rays. Some of the rays are harmless to people. But one kind, ultraviolet (UV) rays, can cause problems. They are a form of radiation. UV rays do help your body make vitamin D, but too much exposure damages your skin. Most people can get the vitamin D that they need with only about 5 to 15 minutes of sun exposure two to three times a week. There are three types of UV rays. Two of them, UVA and UVB, can reach the earth's surface and affect your skin. Using a tanning bed also exposes you to UVA and UVB. UVB rays can cause sunburn. UVA rays can travel more deeply into the skin than UVB rays. When your skin is exposed to UVA, it tries to protect itself from further damage. It does this by making more melanin, which is the skin pigment that makes your skin darker. That's what gives you a tan. This means that your tan is a sign of skin damage. What are the health risks of tanning? Premature skin aging, which can cause your skin to become thickened, leathery, and wrinkled. You may also have dark spots on your skin. These happen because long-term exposure to UV rays makes your skin less elastic. The more sun exposure you have, the earlier your skin ages. Skin cancers, including melanoma. This can happen because the UV light damages the DNA of your skin cells and interferes with your body's ability to fight the cancer. Actinic keratosis, a thick, scaly patch of skin that usually forms on areas exposed to the sun, such as the face, scalp, back of the hands, or chest. It can eventually become cancerous. A weakened immune system, which can increase your sensitivity to sunlight, decrease the effects of immunizations, and cause you to have reactions to certain medicines. What should I do to protect my skin from UV rays? Limit sun exposure. Try to stay out of the sun between 10 a.m. and 4 p.m., when its rays are strongest. But remember that you still get sun exposure when you are outside on cloudy days or are in the shade. Use sunscreen with sun protective factor (SPF) 15 or higher. It should also be a broad spectrum sunscreen, which means that it gives you both UVA and UVB protection. If you have very light skin, use SPF 30 or higher. Apply sunscreen 20-30 minutes before going outside, and reapply it at least every 2 hours. Wear sunglasses that block both UVA and UVB rays. Wrap-around sunglasses work best because they block UV rays from sneaking in from the side. Wear a hat. You can get the best protection with a wide-brimmed hat that is made out of a tightly woven fabric, such as canvas. Wear protective clothing such as long-sleeved shirts and long pants and skirts. Clothes made from tightly woven fabric offer the best protection. It is also important to check your skin once a month. If you do see any new or changing spots or moles, go see your health care provider. Isn't indoor tanning safer than tanning in the sun? Indoor tanning is not better than tanning in the sun; it also exposes you to UV rays and damages your skin. Tanning beds use UVA light, so they expose you to a higher concentration of UVA rays than you would get by tanning in the sun. Tanning lights also expose you to some UVB rays. Some people think that getting a "base tan" in a tanning salon can protect you when you go in the sun. But a "base tan" causes damage to your skin and will not prevent you from getting sunburn when you go outside. Indoor tanning is particularly dangerous for younger people. You have a higher risk of melanoma if you started doing indoor tanning while you were a teen or young adult. Some research shows that frequent tanning may even be addictive. 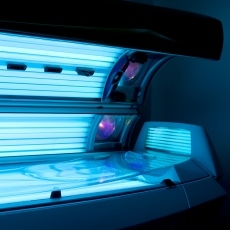 This can be dangerous because the more often you tan, the more damage you do to your skin. Are there safer ways to look tan? Tanning pills have a color additive that turns your skin orange after you take them. But they can be dangerous and are not approved by the Food and Drug Administration (FDA). Sunless tanners have no known risk for skin cancer, but you do have to be careful. Most spray tans, lotions, and gels use DHA, a color additive that makes your skin look tan. DHA is considered safe for use on the outside of your body by the FDA. You need to make sure it doesn't get into your nose, eyes, or mouth. If you use a spray tan, be careful not to breathe in the spray. Also, remember that these "tans" do not protect you from UV rays when you go outside.